Here I've created a slicer based on a quantity of goods sold column (which holds integers between 1 and 8). The boundaries for the slicer have automatically defaulted to the smallest and largest values possible. Here I've clicked and dragged the circles to change the values to run from 2 to 6 (I've also reformatted the slicer a bit ...). You can configure two main parts of a numeric slicer: the Numeric inputs and the Slider. 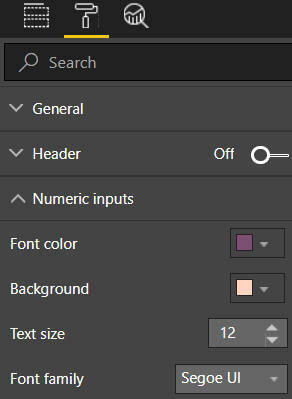 Here I've changed the font colour and fill colour for the numeric inputs to an unpleasant red-on-orange effect. The settings I used to produce this unpleasant combination of colours. 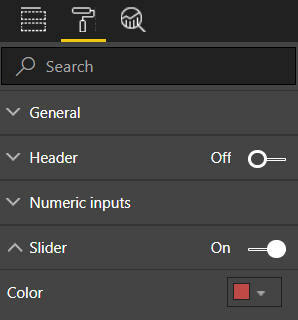 You can change the colour of a slider - and that's it! I would expect to see more properties added in the coming months. The slider is now red (unsurprisingly). This all seems a bit basic to me, but now that the concept has been incorporated into Power BI Desktop maybe it will be jazzed up in future versions?